Engineers rarely receive a rockstar reception at automotive events. Celebrity ambassadors often schmooze glossy crowds, as do skivvy-clad designers, but rarely do quietly-forthright engineers get a look in. 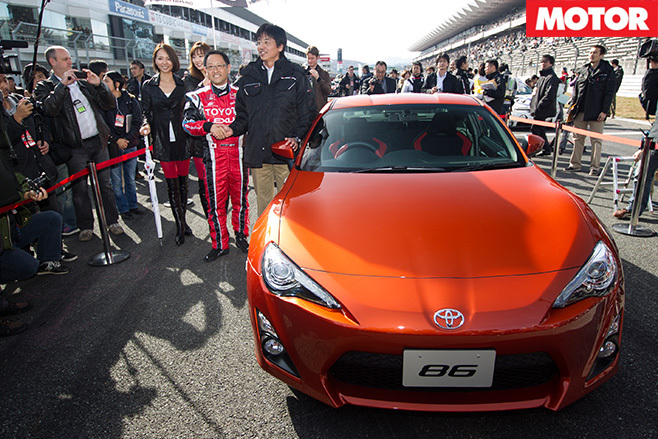 Toyota 86 chief engineer Tetsuya Tada is one of those personalities – and he is front and centre in the spotlight. 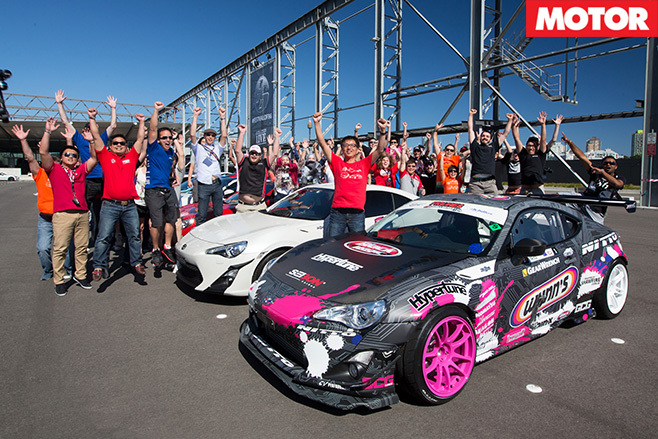 It has been four years since the 86 (and its Subaru BRZ twin) debuted. The $29,990 rear-drive Toyota coupe passed 10,000 local sales two years ago – with volume behind only Japan (39,000) and the US (35,000) – and by mid-2016 the ‘Toyobaru’ duo had doubled that tally. On a frosty Canberra morning in May, 450 owners gather at the Sutton Road Driver Training Centre for the third annual Festival of 86. 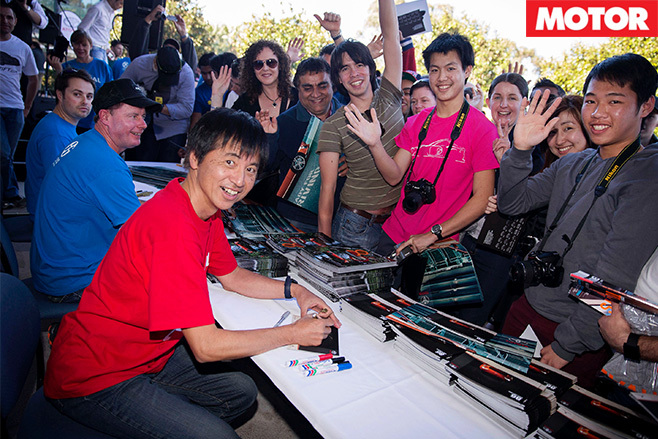 The owners know who Tada-san is – the lanky 59-year-old engineer in jeans, white long-sleeve shirt and sneakers – and they gather like the automotive equivalent of Justin Bieber’s ‘Beliebers’. 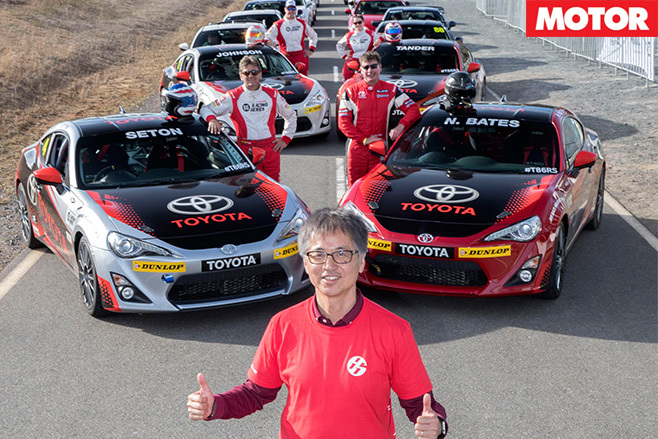 Armed with a marketing budget to make most manufacturers blush, both the festival and the 86 amateur race series, launched on the same day, are Toyota Australia’s paid celebration of what is still its only sports car. Despite promises from company president Akio Toyoda that the brand would bring more fun-to-drive cars to market, none have yet been forthcoming. Nothing has changed with the 86, either. A facelift – attacked by keyboard warriors for raising outputs by just 4kW/9Nm – is due in the third quarter. When we finally secure one-on-one time with Tada-san the question ‘what’s coming next?’ is a weighty ice-breaker to kick things off. 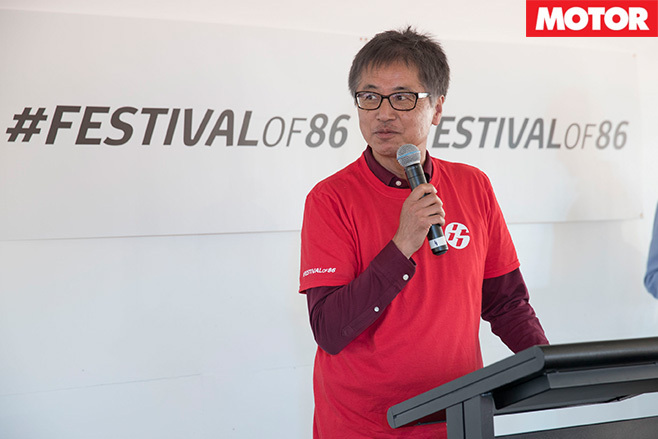 “We have started planning the next generation of 86,” Tada-san confirms to MOTOR, before quickly nodding back to the believers. 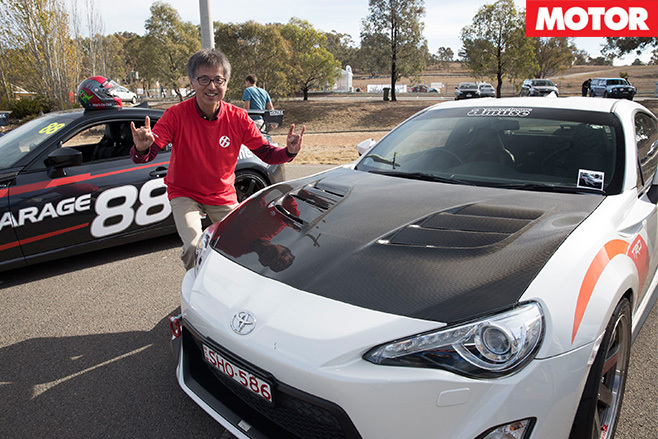 Tada-san laughs when reminded of his previous comments that turbocharging the 86 would be the “easy answer” – and that stance resolutely remains. But what about drawing upon – gasp! – Toyota’s hybrid technology for the next model? “Not necessarily we would be saying hybrid as such, hybrid could be part of the answer but if [we] provide just a normal hybrid it makes no-one surprised,” he responds cryptically. There is a roll-call list of improvements engineers are aiming to make with new models and Tada-san understands them well. He leans back and grins then answers in the affirmative when asked if he’s driven the new Mazda MX-5, a car that has achieved a 1000kg kerb weight. The current 86 weighs 1200kg-plus. The inference is the research conducted into kerb weight reduction for mainstream cars will aid future sports car development. Tada-san confirms that the “big” drop in body weight would help the next 86, but could the second generation hit the magic tonne? “I will try my best,” he says, grinning. Making the coupe smaller, however, is clearly not the simple fix. 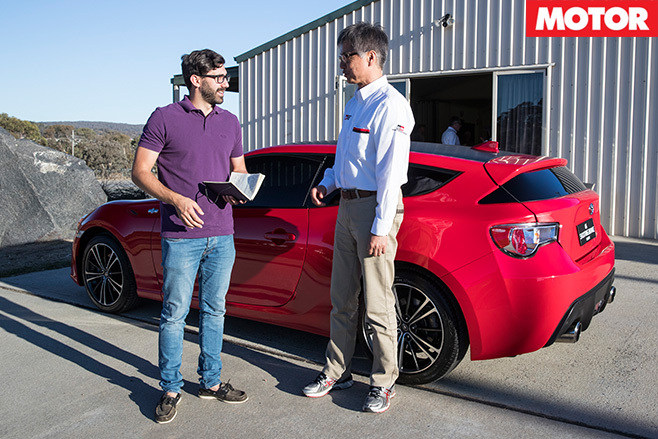 “The 86 maybe can go slightly smaller but it wouldn’t have much of a less weight or make it less cost,” he explains. “At the time when we developed the 86 like that, that was the best balance between cost and [practicality of] usage. Currently, because technology has advanced more … maybe if you reconsider the same good balance we might be able to make it smaller.” We were fibbing earlier. Toyota has produced a sports car recently, but the tiny S-FR – small, front engine, rear-drive – is at this stage a Japan-only offering. “The lighter one [sports car] is easier to make. The smaller one automatically you think would be easier to make because it’s smaller, but it’s not that way because it still needs to be safe for accident so all that strength will still be demanded. It remains same [cost]. It’s not that easy to make that smaller car. The man who next year notches up three decades working for Toyota would love to see a ‘family’ of 86 variants – including the Shooting Brake displayed at the event – but that fierce internal regime clearly rings in his ear. He needs to be delicate. He has seen Toyota sports cars fall hard before. 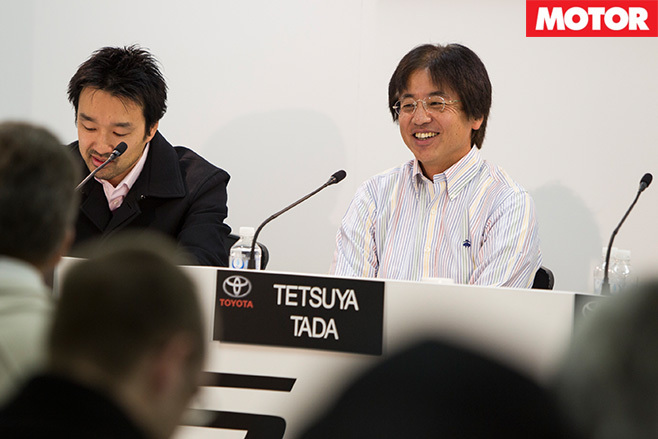 “Continuation is something [important] because in the past Toyota make so many sports car and then when the profit goes down they finished every single time and didn’t continue,” Tada-san tells. That ‘original’ is likely to be produced until 2019 – the year Tada-san hints something big could be revealed at the Tokyo motor show. He rejects the suggestion that the facelifted 86 offers few changes, claiming “enormous” improvements have been made to the body rigidity, suspension and stability control tune of the facelifted coupe. In quick quips between his rockstar treatment at the festival he admits he would love to build a hot-hatch and hopes the Yaris WRC car would be an indicator of things to come. Ideally Toyota should have its own sports division like Renault Sport or AMG, too – and not necessarily TRD. But we finish with the big gun: Supra, when is it coming? “Ah, Supra!” he exclaims, visibly excited by the project. "It’s very hard to tell when the Supra will be produced, but regarding the 86 we weren’t really focused on the speed or the power [but] on simply so much fun to drive. When we consider the 86 so many users consider it is not enough power, it is not enough speed, because they want to focus on that. “But the next release production of the Supra [we] would like to go beyond that. [Something] you can enjoy driving around that comes with the power and comes with the speed.” However, it also appears the production ‘upper sport’ coupe – Toyota’s PR person politely reminds us that the ‘Supra’ name is unconfirmed – will share a development philosophy with the 86.